'Batman' #2 opens with Gotham City's newest dynamic duo trying to contain a very pissed off Solomon Grundy. Try as they might, Gotham and Gotham Girl still have some learning to do as Batman tames the not-so-gentle giant. 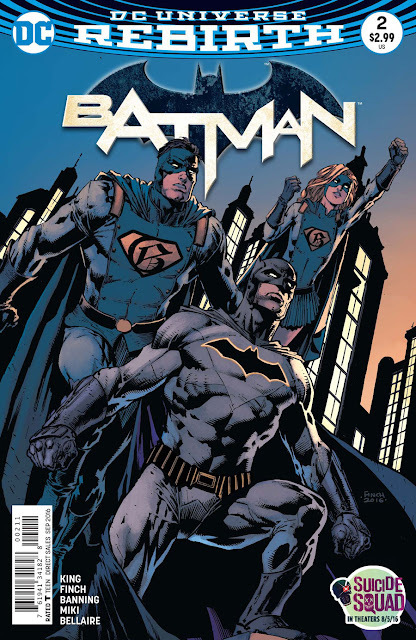 It's a new era for the Dark Knight as Tom King and David Finch try to build off their cleanly executed first issue but face some growing pains in their second effort. While I've enjoyed the first two issues so far, Batman has a different voice, a less-than-confident tenor that is hard to pinpoint. I recognized in my review of issue #1 that taking over for Scott Snyder after an epic run is a mighty task for anyone but King has the talent to make the series his own. He's still finding his footing, using familiar story beats and situations to help find his way. It's not necessarily bad, far from it, but we are witnessing what any writer would be like taking over an iconic staple like Batman comics, a shaky but efficient narrative. Batman is far more trusting now bringing the Gotham duo into the fold rather quickly appreciating their superpowers and what that means for the safety of all Gothamites. He's embraced these "supermen" with little vetting. The same could be said for King who hasn't developed the mysterious couple or revealed their true identities yet they're getting introduced to Commissioner Gordon. They seem earnest in their desire to protect the city and learn from Batman. Batman is equally invested in showing them the ropes so they can do what he can't. Bats ponders his fate, his mortality, in ways I haven't seen before. He's much more cognizant of his limitations. Meanwhile, Gordon gets an unexpected visitor with a dire warning. A warning that makes a lot more sense when part of it is revealed at the end, welcoming back a familiar old villain in a new context. This is more set-up to what could become some great storylines that harken back to old battles in Batman history. The art is very sharp and dense with great detail and thick lines. Finch draws an overwrought Gordon but overall the layouts are smooth and engaging. Matt Banning and Danny Miki provide a heavy dose of inking that is prominent throughout the issue creating some bold depth and design to each panel. Jordie Bellaire is Jordie Bellaire which means the colors are fantastic.The tone is warm with plenty of deep hues from orange to yellow to green. The world-building is dark but not dreary, more of a cigar lounge aesthetic than a damp dungeon. 'Batman' continues to evolve under King who probably needs to get through an arc to find his groove. The set-up in the first two issues appears promising with some interesting twists. It still needs more character development but I'm optimistic there are great things to come given time. Still worth picking up and readers should be rewarded.